March is Women’s History Month. This year it coincides with our ongoing commemoration of the World War I Centennial. Did you know the extent to which DAR members tirelessly worked on behalf of war relief both during and after the Great War? With American men mobilized to fight, some American women took advantage of their first opportunity in American history to enlist in the armed services during wartime. Thousands of women joined the Army as nurses—or the Navy or Marine Corps as yeomen. Approximately 260 DAR members went abroad to perform war service; an additional 125 DAR members enlisted but were not called up. While some women acquired employment in traditionally male jobs to help ease the labor shortage caused by men going overseas to fight, the majority of women’s involvement during the war was accomplished through voluntary organizations that supported the war effort. 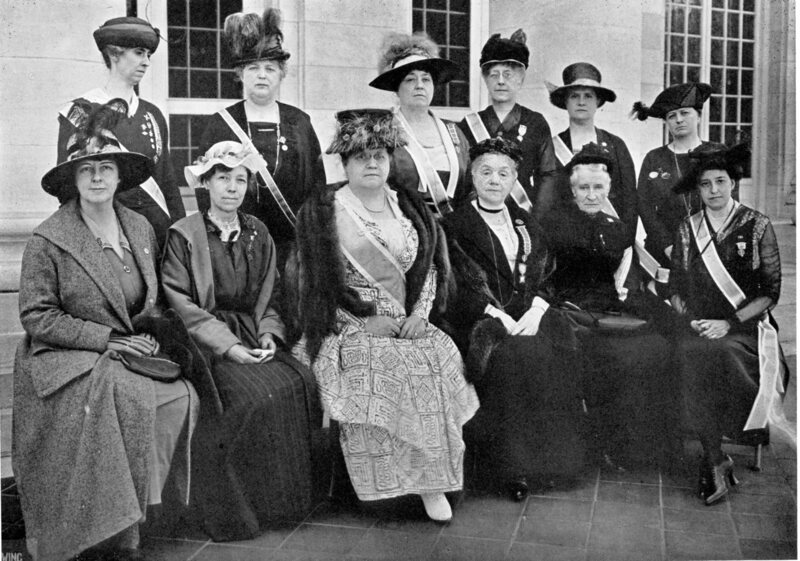 Thousands of women in the United States formed and/or joined organizations such as the Navy League, the YWCA, the Women’s Temperance Union, the Red Cross, and the DAR to contribute to war relief activities. The DAR’s 26th Continental Congress commenced only ten days after war was declared on April 6, 1917. Sarah Mitchell Guernsey was sworn in as President General. A natural born leader, Mrs. Guernsey formed the DAR War Relief Service Committee during her first week in office. The War Relief Service Committee was a DAR National Committee formed to organize DAR’s war relief efforts. The members of the War Relief Service Committee are pictured here. This photo was taken on the South Portico of Memorial Continental Hall. 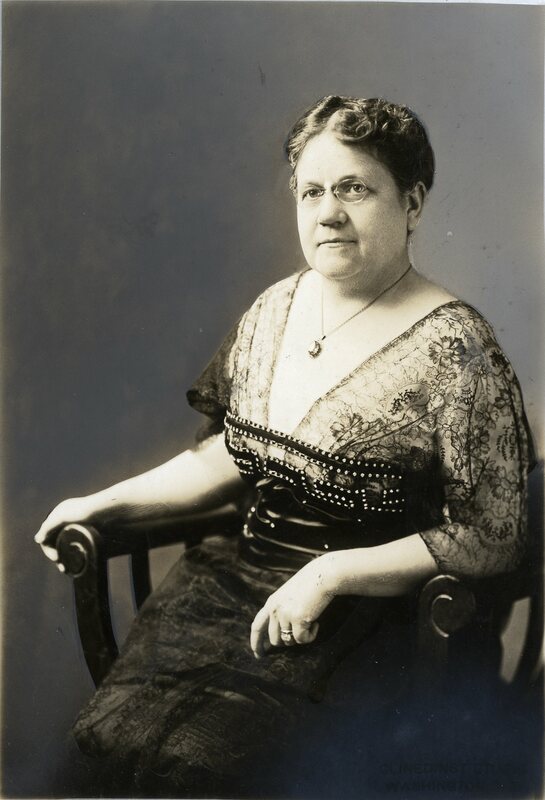 The most prominent voice of the War Relief Service Committee was its Director of Publicity, Michigan State Regent Clara Hadley Wait. In addition to leading her own state, her service in this position greatly impacted all of the DAR’s volunteer service efforts during the war. 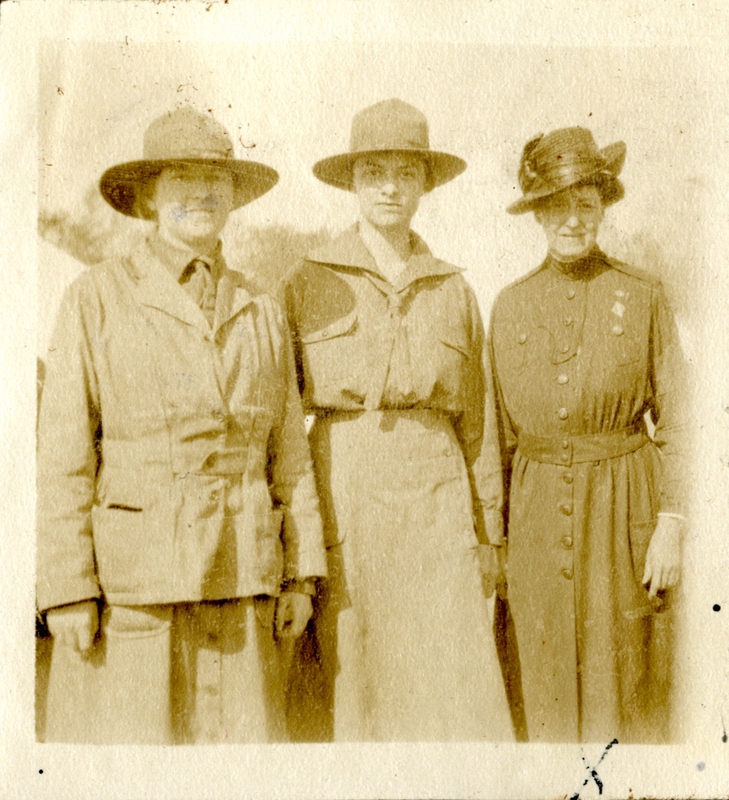 She’s pictured here on the far right posing in her Navy League uniform. With the war in full force, the U.S. government was not prepared for the costs involved and needed additional funding from its citizens to guarantee victory. The federal government estimated that the war would cost it more than $30 billion. DAR chapters across the country gave up everything they thought was too frivolous in wartime –gone were their social events and even their refreshments. The accumulated savings funded war relief activities. The War Relief Service Committee also encouraged DAR members to help finance the war through the purchase of Liberty Loan war bonds. The DAR’s largest financial contribution to war relief, both in terms of funds and national importance, was its donations to the four Liberty Loans and the final Victory Loan. Funds were raised in many other ways as well. Members held benefit concerts, rummage sales, and other events. They also made and sold flags, and donated unwanted precious metals to communal melting pots. With the money they raised, DAR members had sufficient resources to fund diverse projects. One of their most successful ventures was their knitting campaign. 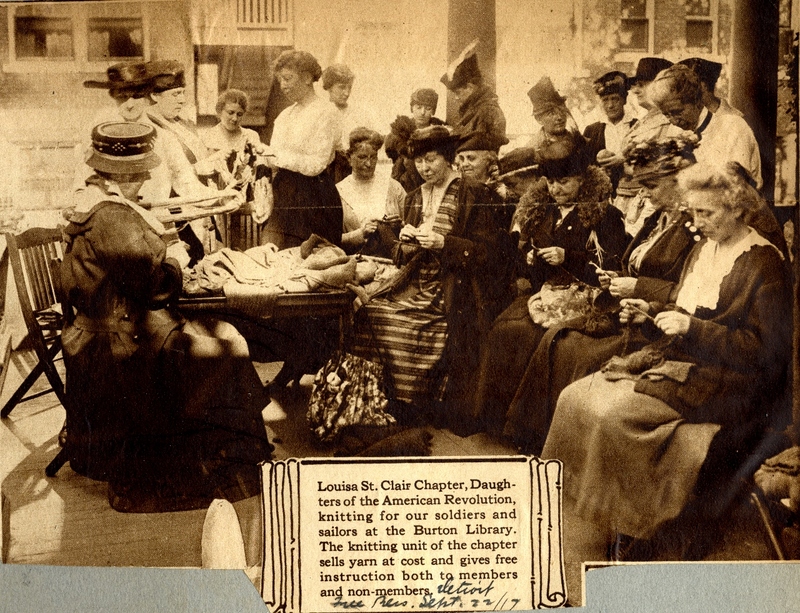 Weekly chapter meetings became weekly knitting bees as they made socks, sweaters, hats, and gloves for American soldiers and sailors. DAR chapters’ knitting circles were so efficient that local Red Cross chapters asked the DAR to take complete charge of their Knitting Department. The Daughters staffed their local Red Cross rooms, instructing beginners and ensuring an abundance of available yarn. By June 1918, the War Relief Service Committee learned of a plan the American Committee for Devastated France developed to “rechickenize” France. The DAR responded with a bulletin proposing that Daughters organize local campaigns to involve their communities’ children in this war relief effort. The goal of the fundraising campaign was to supply the French people with much-needed poultry farms to fill a gap in their food supply. 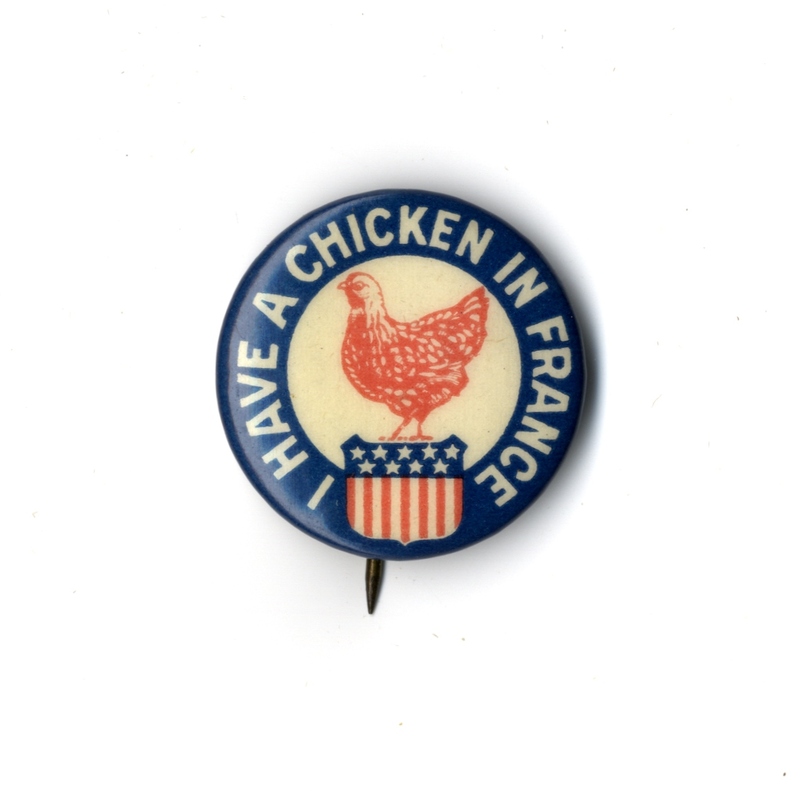 To encourage donations, the DAR created an “I have a chicken in France” button pin, given for donations.